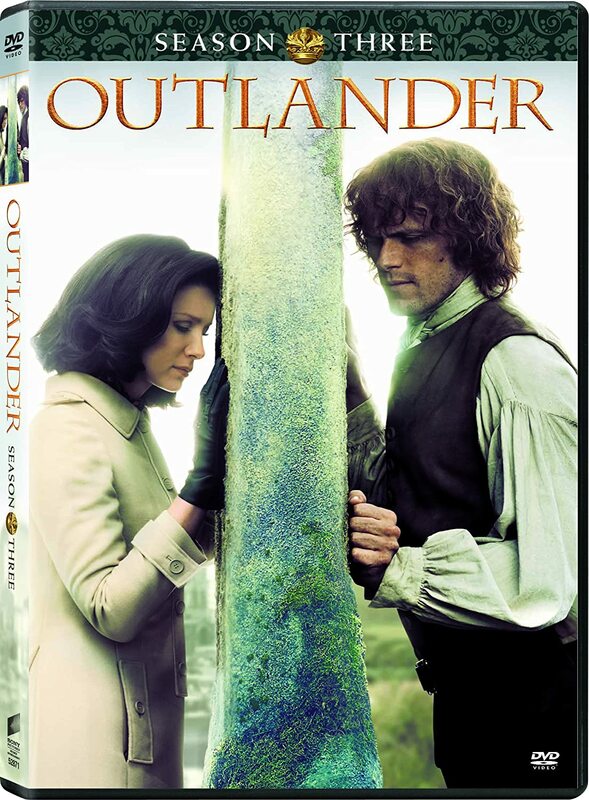 Outlandish Observations: Happy Birthday to Diana Gabaldon! 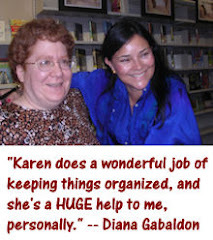 Happy 60th Birthday to Diana Gabaldon! I hope she has a wonderful day. Here is my tribute to Diana on her birthday: a selection of quotes from the books that remind me of her. These sorts of "authorial intrusions" are very rare in Diana's books, but I always enjoy the little glimpses of her own personality or writing habits coming out in her novels. I thought I'd share some of my favorites with you. 2) Diana is very much a night owl. She does most of her writing from about midnight to 4 am. Evidently, the whole household was now wrapped in slumber--save him. He rather liked the feeling of solitude, like this, he alone wakeful, lord of the sleeping world. 3) Diana doesn't write in a straight line; she doesn't use an outline; and she often doesn't know where the beginning of a book is until she's well into the writing of it. I closed my eyes in reflex, then opened them again. Where ought I to begin? Begin at the beginning and go on till you come to the end: then stop. The line from Alice’s Adventures in Wonderland drifted through my mind, and I smiled. Good advice, I supposed— but only if you happened to know where the beginning was, and I didn’t quite. I twiddled the quill a bit, thinking. Perhaps I should have an outline? That seemed sensible--and a little less daunting than starting straight in to write. I lowered the quill and held it poised above the paper for a moment, then picked it up again. An outline would have a beginning, too, wouldn’t it? Grey's days were a blur of activity, rushing from Whitehall offices to shipping offices, holding daily councils of war with the other officers, receiving and reviewing daily reports from the captains, writing daily summary reports for the colonels, reading orders, writing orders, hastily donning dress uniform and dashing out to leap on a horse in time to take his place at the head of a column to march through the London streets in a guildhall procession to the cheers of a crowd, then throwing the reins to a groom and brushing the horsehair from his uniform in a carriage on his way to a ball at Richard Joffrey's house, where he must dance with the ladies and confer in corners with the gentlemen, the ministers who ran the machine of war, and the merchants who greased its gears. The one redeeming aspect of such affairs was that food was served, often his only opportunity to eat since breakfast. Brianna stepped out into the corridor and slammed the door behind her. It was a solid door, and the resultant boom temporarily halted the outcry. On the other side, Jemmy began to cry, but she ignored him for the moment. She drew a deep breath, prepared to wade into the melee, but then thought better of it. She couldn't face the thought of the interminable wrangling that would come of dealing with them as a group. Divide and conquer was the only way. "I am writing," she declared instead, and looked narrow-eyed from face to face. "Something important." Mrs. Aberfeldy looked impressed; Mrs. Chisholm affronted; Mrs. Bug astonished. She nodded coolly to each one in turn. "I'll talk to each of you about it later. Aye?" 6) Flora MacDonald's appearance in ABOSAA seems to be very similar to what Diana goes through in her public appearances. I had to admire her; she was besieged on all sides by people wanting a word, but she kept her poise admirably, being kind and gracious to everyone--though this meant sitting sometimes for ten minutes, a forkful of food suspended in air as she listened to some interminable story. "I have heard the point made, though, that the novelist's skill lies in the artful selection of detail. Do you not suppose that a volume of such length may indicate a lack of discipline in such selection, and hence a lack of skill?" Fraser considered, sipping the ruby liquid slowly. "I have seen books where that is the case, to be sure," he said. "An author seeks by sheer inundation of detail to overwhelm the reader into belief. In this case, however, I think it isna so. Each character is most carefully considered, and all the incidents chosen seem necessary to the story. No, I think it is true that some stories simply require a greater space in which to be told." I love your choices, Karen. 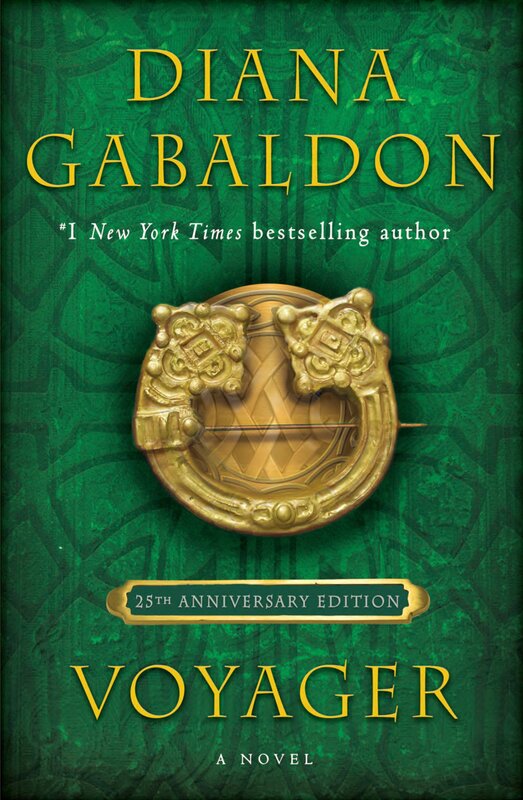 Rereading that line of Bree's makes me feel like rereading Fiery Cross again! The book itself is my favorite of all time (and honestly defies description or classification), and I have now read it two or three times, listened to the abridged version, and also listened to this unabridged version. Do not waste your time with the abridged version. Too much detail is left out, and the beauty of the author's writing is in the detail. 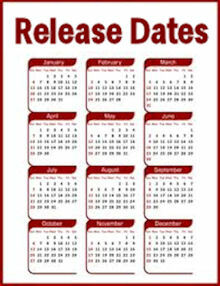 Plus, you'll miss at least one pivotal scene.